"I’ve always wanted to see something of the Empire outside Rome." AD 71. Germania Libera: dark, dripping forests inhabited by bloodthirsty barbarians and legendary wild beasts, a furious prophetess who terrorises Rome, and the ghostly spirits of slaughtered Roman legionaries. Enter Falco, an Imperial agent on a special mission: to find the absconding commander of a legion whose loyalty is suspect. Easier said than done, thinks Falco as he makes his uneasy way down the Rhenus, trying to forget that back in sunny Rome his girlfriend, Helena Justina, is being hotly pursued by Titus Caesar. His mood is not improved when he discovers his only allies are a woefully inadequate bunch of recruits, their embittered centurion, a rogue dog, and its innocent young master - just the right kind of support for an agent unwillingly trying to tame the Celtic hordes. 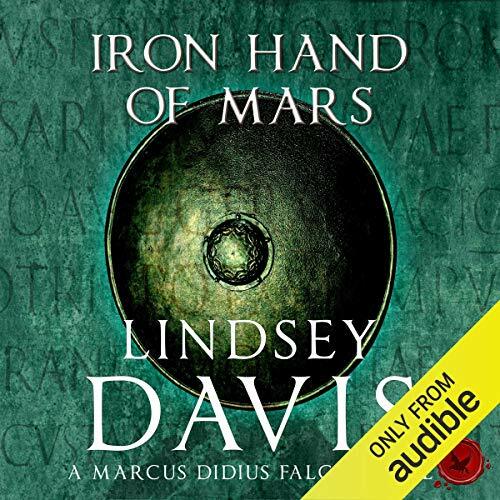 ©1992 Lindsey Davis (P)2015 Audible, Ltd. The story is not a detective story in Roman clothing. Interesting at it was to read, the story did not deliver what I have come to expect and appreciate from Lindsey Davis. The second drawback is the odd perspective, which I seen in many of Davis' books but which has vanished with the Alba subseries. Davis is writing in first person with Didius Falco doing all the interaction. But it is a modern, female, middle aged English woman doing the writting and it does not really work here. Didius Falco is some idealized contemporary man without any believable inner machinery. Had he been a true Roman he would have been the unchallanged and unrivalled master of his houselhold. His woman could hope for a respecful treatment, but the sexual mores was completely differentat during that time. Marcus can sexually use and abuse all his householders, slaves, freemen as well as animals. Without any missgivings about this from anyone. He legally could kill his own offspring or slaves (no need to hide a dead slave under the bedroom floor there, as it happens in the story. Nor would his teenage girls behave in such a modern manner) In this book, the distance to the Rome of antiquity is too large and the story suffers. In later books these things have become less obvious, but the sickening smell of a Roman man whipped by his woman remains all over the series in a blatantly gendered and ahistoric missconception of what a man is. A female Eye so to say has written this. Love the books...Bring back Christian Rodska! Please! He has a much more sympathetic voice for the character and he shifts back into pompous mode after every break in the narration. If I didn't love Falco so much I would not have bought the books and I don't enjoy listening with gritted teeth. Christian Rodska narrating, and a some sun, warmth and joviality. Too full of long historical tracts about various legions of the Roman Army. Set n Germany inthe weather is always wet, cold, raining, drizzly, dank and depressing. A Falco set back in Rome. What didn’t you like about Gordon Griffin’s performance? He does not sound lke Falco, as he is not a cheeky chap who uses his charm and wit to get results. If you could play editor, what scene or scenes would you have cut from The Iron Hand of Mars? It may not be read by Christian Rodska but is really well read and I will be getting the others read by Gordan Griffin. The historical references are very good, embedded as they are in a multi-stranded plot with the wonderful characters from the Falco series. Prefer Christian Rodska to read these books as he gives a more authentic impression of Falco. I've listened to all the Falco novels several times and love the plots, the characters and the wit. This one is of the usual quality - excellent. I find I enjoy Gordon Griffin just as much as Christian Rodska. I don't know what the criticism is about. They are both brilliant! Strange pronunciation of Latin words and names and has great difficulty in varying voices from bland Estuary English. Story is good, though, and important to continuing Falco saga. I now have to get a Roman map of Europe so that when I revisit this, I can trace Falco's journey!